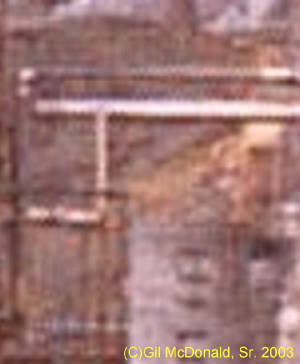 *This is an alien structure (antenna?) @ the ABO. 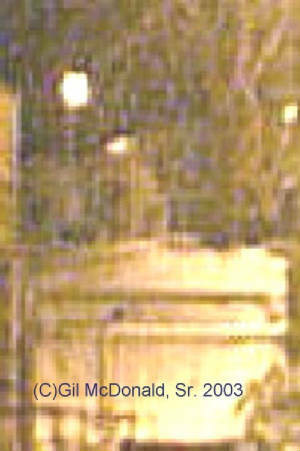 This object (just past dish antenna) is not visible to the human eye but was caught by the camera. Mr. Toothy was the name I gave to the alien who was the guide for the Royal Family and perhaps the pilot of the shuttle craft. OK, I admit it. I had the habit of naming these ghost aliens based on their appearance and Mr. Toothy had an outstanding set of teeth. A brief description will explain. Mr. Toothy had a body that was very similar to the other aliens only his clothing was mostly all gray. He was of medium height and there was nothing outstanding about him except his head & mouth. His head was huge, much to large for his average size body. The head was shaped like an egg with the small rounded tip at the bottom where the chin would be. His eyes were those of orental persuasion & his mouth was an extremly large circle that took most of the space in the lower two / thirds of the huge head. His mouth had teeth in it but it was just like a set of piano keys. The teeth had no division runing about half way such as we would consider normal. His teeth looked like a long row of extra long piano keys that ran from the top of his mouth to the bottom of his mouth. I never saw his mouth close or his lips move, not even when his hand and body motions indicated he was speaking. Mr. Toothy was like a personal assistant to the Royal Family. He stayed with them during their part of the tour that I witnessed. When the Royal Family is on the shuttle craft ready to depart Mr. Toothy played a very active part. He may have been the controller of the shuttle craft. ...human eye or the camera during the sunlight (ultra violet ray?) hours. I first saw the shuttle craft @ 3:30 AM on 2/28/2001. The industrial area, had for some reason, been kept quite busy by humans until 3:00 AM as a busload of inmates were being moved out of this prison to a newer unit on the edge of town. After all the humans (except me) had left the area the aliens began to show themselves and move around about as usual. Then suddenly the shuttle craft slowly drifted out from behind the brick building on the left, (the old heating plant). Two large aliens (looking like colorless cartoon characters except for their golden glow) were halfway out of some openings on the top of the craft. I watched in amazement, not wanting to take my eyes off of this, all the while feeling around for my small camera & trying to get it turned on. The camera takes several seconds to go through the process and then I had to glance at the monitor quickly to press a button a couple of times to turn off the flash. By the time I had the camera working the craft had docked with a fairly loud 'thunk' as it bumped up against the cement stairway just to the right of the shuttle craft. I took several pictures as quickly as possible but the camera takes several seconds to process each photo. The ship had been floating just like a small fishing boat floats on the water as it comes in to the dock. It seemed that the two aliens on top had never stopped looking my way. I was a little frightened. Things settled down a little and I kept a close watch on them and tried for another photo if the scene changed very much. A note here about the old heating plant. I had been told that no one ever went into the old heating plant and no one had been in there since 1980 or earlier. The reason given was that it had asbestos insulation. I always wondered if that was the real reason and I also wondered if the aliens had some special operations set up inside of that undisturbed building. It was impossible to see through the dirty windows of the old brick building. I watched the ship use it's cloaking device just before a prison officer on yard patrol walked into the area. When they cloaked they were totally invisible to me. 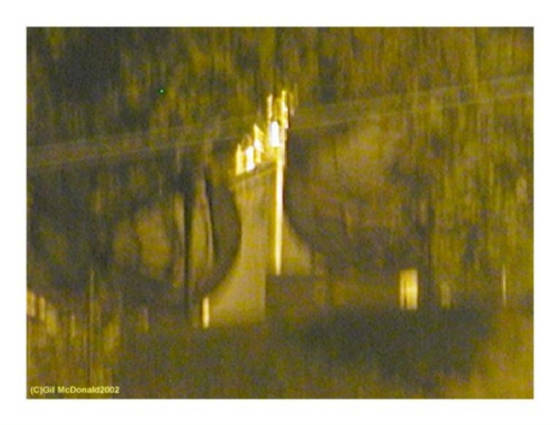 A few minutes after the officer had walked thru the area (within a few feet of the ship) they uncloaked and were once again visible to me. Their cloaking device on this particular craft was used for less than fifteen minutes (my guess). That would be just fine if they were moving in space as they could probably move a very great distance in fifteen minutes, but just sitting still, all I had to do was sit & wait. As far as I know the shuttle craft stayed at that one spot until March 3, 2001. I had started my observations the previous evening at about 11:00 PM. When I first arrived & started my night shift, I could see that the Royal Family was already on tour. They must have arrived before I did. A large crowd of their people were close by. All of their people were fully dressed in various shades of gray for this occasion. The women wore light gray (almost white) blouses and dark gray (almost black) skirts. All of the men wore light gray shirts & dark gray pants. I never mentioned it before, but when these aliens were in the human form they were always fine looking people. All of the gray people had gray outlines and clothing of various shades of gray. There were no other colors shown. The Royal Family was slightly different. All three of them had their bodies & features outlined with gold. Even their clothing was outlined in gold. The male (King?) was tall, well built but not muscular, his hair was golden curls and his features were handsome & strong. He wore a garment that wraped around him similar to that worn in ancient Rome by people of wealth & power. He walked like a man walks. Not proud or boastful, but confident & sure. He had no fear or distrust & he was not afraid of his people nor was he concerned about his stay on this planet. The older female (Queen?) was almost as tall as her companion. She also was outlined in gold and wore a long flowing dress that reached the ground. Her hair was dark, down to her shoulders and beautiful in style. Her features showed beauty, maturity & wisdom. But the one who walked in front of these two monarchs was the young & beautiful female (Princess?) who was slender, dressed in a long flowing, sleveless gown, all with golden outlines. Her hair was styled beautifuly, shoulder length & topped with a piece of jewlery that had the full appearance of a diamond tiara. And now you know why I called them the Royal Family. They may have already completed most of their visit. I will never know for sure. They had one experiment or contest while the Royal Family & I watched. The two gate building disappeared and a large, wide & long conveyor belt suddenly appeared before us all. The Royal Family stood on one side, the contestants and the large crowd of people were all on the other side. This area was on the top of the hill & to the right of the parked location of the shuttle craft. A large block of what appeared to be wood appeared on the conveyor belt and the belt began to move. The block seemed to move very close to the end of the conveyor belt but when it reached that position it would move back to the far end of the belt without anyone touching it. The contestants would change, the block moved forward to the middle of the belt without anyone touching it & over & over the belt would start moving & the block would go to the end of the belt but never fall off the end. When the contest was finished the conveyor belt & block suddenly disappeared and the two gate building was once again back in it's place. I didn't have a good view of all this nor did I understand, but the Royal Family and the large crowd of their people seemed to be very pleased with the results. Then it was time for the Royal Family to depart & several strange things happened in the next few minutes. The Royal Family made a change that shocked me & yet I found it still to be very pleasing. They were not happy when they discovered that I was watching them. They used their force field. The shuttle craft leaves but it takes thirty or forty seconds to get up to full power. Verticle stripes caused by curtains of cloaking material. I have no explanation for what I saw. But this is the way that I saw it happen. After the demonstration or contest of 'telekinesis' the Royal Family walked away and down the hill to walk onto the top of the shuttle craft. They stepped off of the side of the hill & onto the shuttle craft as if they were closely joined. The shuttle craft rocked slightly as they stepped onto it. They were led by their guide (Mr. Toothy as I called him). The Royal Family took positions on the left side of the top of the shuttle craft. The Princess was first, then the King, & then the Queen. Suddenly their appearance changed. They no longer had the outline of humans as I have previously described them, but now they all had the (brown) body of a manatee and the head of a young gray elephant, complete with trunk and their eyes were situated in the same place as a young elephant but their ears were shaped like those of a mule deer. (GANESHA - On 9-14-2011 I learned that the people of India have an idol named Ganesha whose head and face look very similar to the creatures that I saw on the Shuttle Craft in the year of 2001) Their arms were represented by two flat (red) circular disk about 18" in diameter. I do not remember if they had these disk where their legs had been but I believe their bodies ended as the manatee body does with two small flippers in that area. They were still in an upright position & their (brown - manatee) bodies (appeared as if they were made from clay) were so heavy that they were bent at the middle. When I looked at the young Princess (& she was half the size of the King & Queen) I said 'Oh, that is so sweet' aloud and the King looked directly at me & said something to Mr. Toothy. Mr. Toothy looked at me with some meaning (?) and then he went thru a portal & down into the shuttle craft. The shuttle craft cranked up. The top (the first top surface where the royal family were standing) stayed stationary and the second ring began to spin to the left. It must have been attached to a part of the craft that was inside & out of my view. After a few seconds the third ring (the bottom part of the ship) began to spin to the right and the bottom outer hull of the shuttle craft was spining with it as if they were attached. I could see the force field over the top of the shuttle craft. It showed with a royal purple outline (it usually had a gold outline) and a strong wind blew within the force field over the top of the shuttle craft as the second & third rings of the shuttle craft were spining in opposite directions from each other. There was a tree limb in the top of the force field bubble & it showed the force of the wind that was blowing inside the force field. The rest of the large tree which was outside of the force field showed no effect from the movement of the shuttle craft rotation and was quite still and calm. As the ship was spinning it was also vibrating and shaking slightly as if something was slightly out of balance. I watched as all this took place. I remember thinking 'This must be an old piece of equipment. Look how long it takes to get cranked up.' Somewhere in the back of my mind I counted as all this took place. After 30 seconds or longer all the spinning stopped. Everything froze in place. There was the image of the shuttle craft with its three members of the Royal Family frozen in place. Nothing moved for a few seconds. Then the frozen still image of all, the Royal Family & the shuttle craft, fell to the ground. When it hit the ground it made a sound like 'plooop'. The shuttle craft and the royal family were gone. A later article gives the theory on the frozen image that was left behind. Twenty minutes later the shuttle craft was back. This time it just reappeared in the docking position. Mr. Toothy exited the craft from one of the portals on the top. He then went to the top of the hill and began to make a speech to a large crowd of the alien population. I couldn't hear him speak and didn't see any change of expression on his face nor did I see his lips move, but he was making body and hand gestures just as humans do when they give a speech. For some reason I got the impression that the Royal Family was not too happy about something they had seen while they were on tour.